This conference aims to equip and enable men, especially pastors, preachers, church teachers, and seminary students to preach God’s Word correctly and faithfully by examining what the Bible teaches about the supremacy and inerrancy of Scripture, and by discovering what expository preaching is and how it is ought to be done. 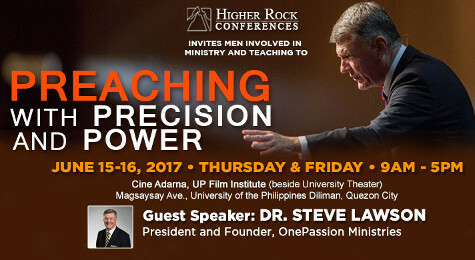 Join us on June 15-16, 2017 at Cine Adarna, UP Film Institute to hear Dr. Steve Lawson share precious truths that will help men in ministry become more effective servants of our Chief Shepherd. The registration fee is P800, which includes a conference kit. The specific purpose of the Preaching with Precision and Power conference is to minister to men who serve as pastors, elders, leaders, and teachers of their local church. We encourage women interested to learn from Dr. Steve Lawson to consider attending the Sufficiency of Scripture Conference. We are very thankful and excited about your attendance to the conference Preaching with Power and Precision. If you have successfully registered or received a tentative registration notice from our team, then you should have received these information through your email as well. On Jun 15, Conference check-in starts at 8AM and session starts at 9AM. However, some registration counters will be open by 7AM for early-comers. The venue is within the vicinity of several schools, colleges and universities so plan your route to the Venue and give ample allowance for possible traffic. Advise your replacement participant to come early to the Conference venue on Jun 15, bringing a copy of your QR Code or Registration confirmation email. This will facilitate the transfer process and Conference check-in.